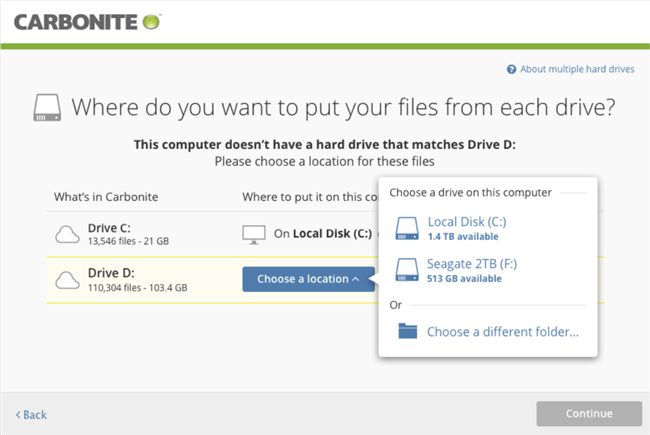 You can restore all your files to a new or repaired computer with the same operating system using the Carbonite Safe software. 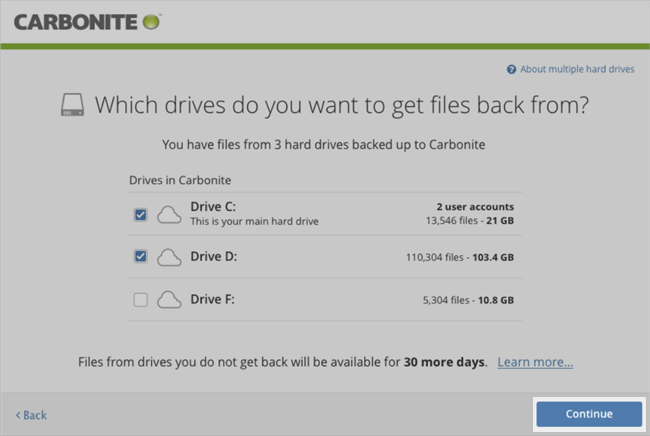 Your Carbonite online backup does not include your programs. You should install your programs before or after restoring your files. Any program installed during the restore process may interrupt the restore. 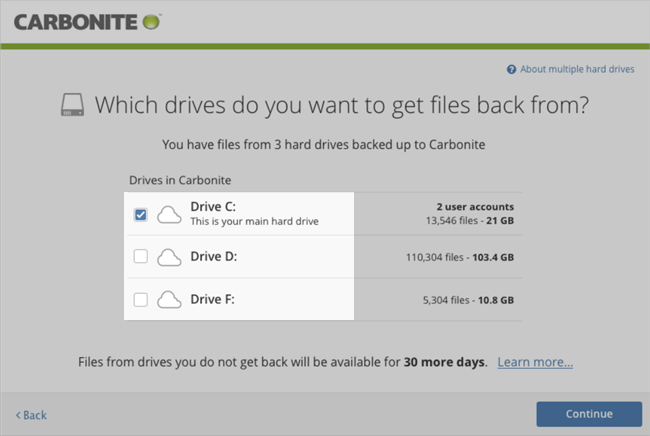 Signing in to your account and installing Carbonite is the first step to restoring all of your files. If Carbonite is already installed on your computer, you may skip ahead to the next step. Click the button above to download the Carbonite Setup file. 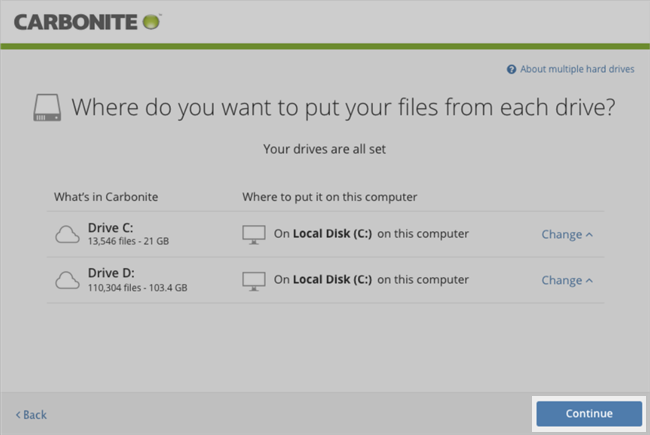 Run the file and follow the prompts to install Carbonite and restore your files. If you need additional help, please reference the steps below. 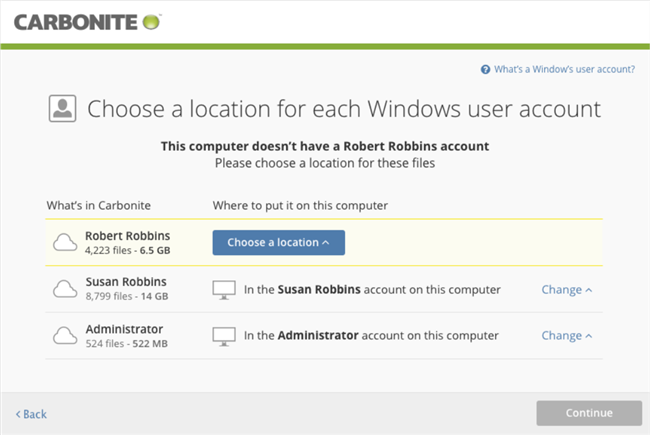 Double-click the Carbonite icon on your desktop to open the Carbonite application. 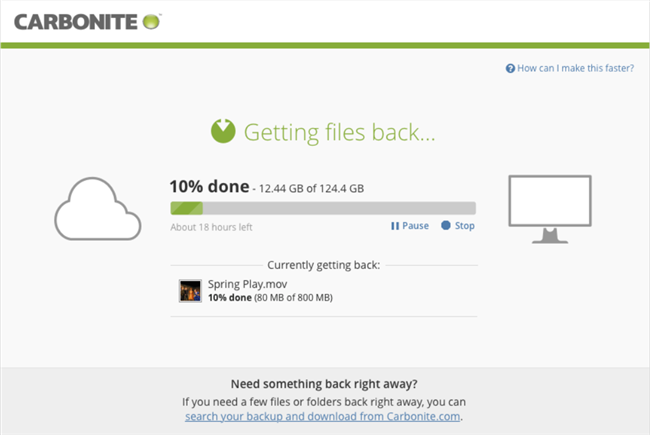 Within the Carbonite application, click the Get my files back link. Click the Get all of my files button. Follow the on-screen instructions within the Restore Manager. Note: If you would like to choose the files you would like to be restored, you can restore individual files or folders. 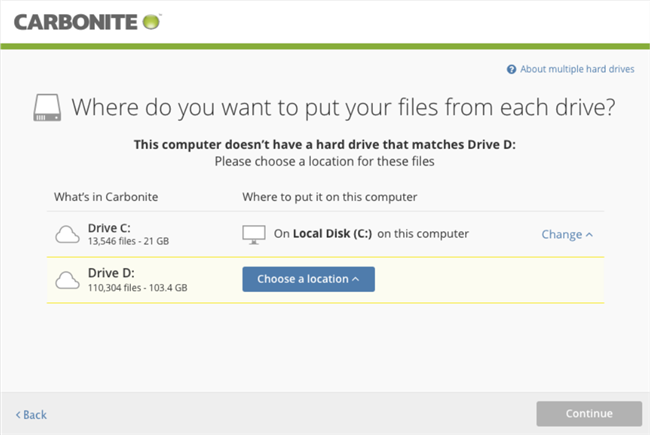 If you had backed up multiple hard drives with Carbonite, you will be given the option to select which drive(s) you would like to restore your files from. After making your selection, click Continue to proceed. Any data not restored will be removed from your backup 30 days after exiting Recover mode, if it is not otherwise present on your computer and selected for backup. If a hard drive on your old computer no longer exists on your new computer, you can select a restore location on your new computer. From the Choose a location drop-down menu, you will be presented with available restore locations on your new computer. Here you can choose how Windows User data in your backup will be restored. The name of each user account will appear on the left under What's in Carbonite. If any of the Windows user accounts on your old computer don't exist on your new computer, a Choose a location drop-down menu will appear to the right. This will allow you to choose a restore location for that user. 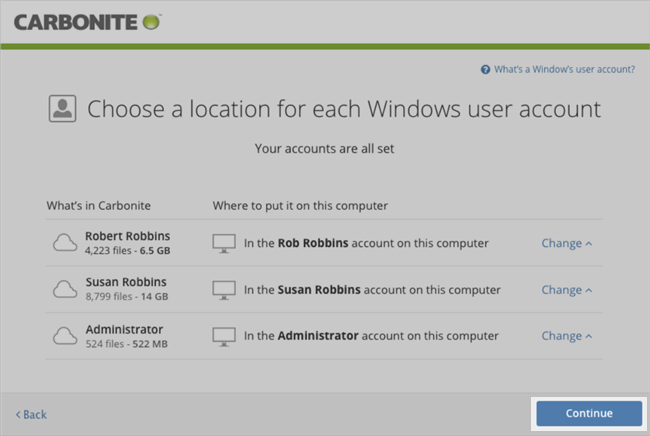 Carbonite attempts to automatically match the backed up users to user accounts on the current computer. If it finds a match, Carbonite will select the matching username automatically. Choose an account on this computer - This will list all Windows user accounts on the new computer you can restore your files to. Create a Windows user account - This will create the Windows user account on your new computer that existed on your old computer. Choose a different folder - This will restore the files to a folder of your choice on your new computer. 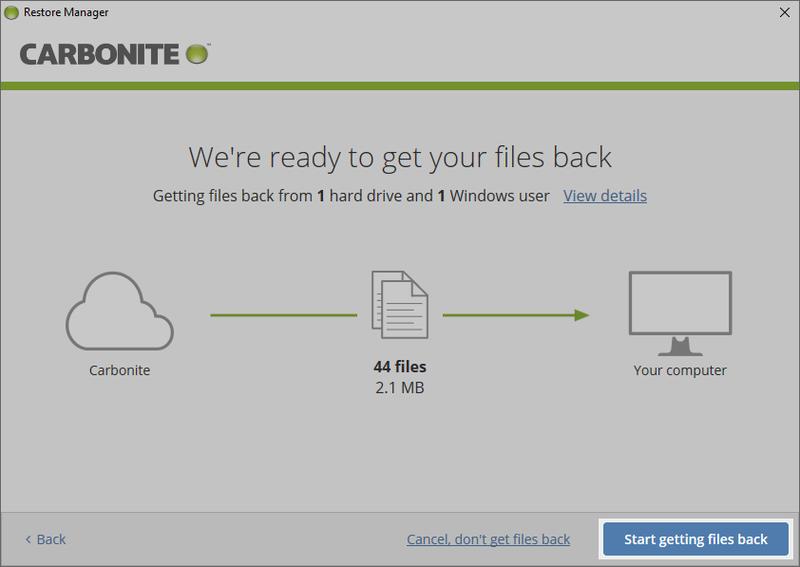 Don't get these files back - This will not restore the data from that Windows user account. If you are logged into the computer as a non-administrator user, you may see a warning message stating user profiles can not be restored. To restore this data, you must be logged into the computer as an administrator. You will be presented with your restore choices. Click View details to review your restore selection. Once you're satisfied with your choices, click Start getting files back. Once your restore has started, you will be able to review the overall and individual progress of your restore. The progress of your restore will be displayed as a percentage. Information about the file currently being restored will also be displayed. You may see screens indicating that your backup is "paused for safekeeping." This is the correct setting during restores and is perfectly normal. Please stay in recover mode while you are restoring your files to ensure everything progresses smoothly. It is strongly recommended that you keep your computer powered on to help restore as quickly as possible. You can find out more information about this in the Configure Your Power Settings section below. 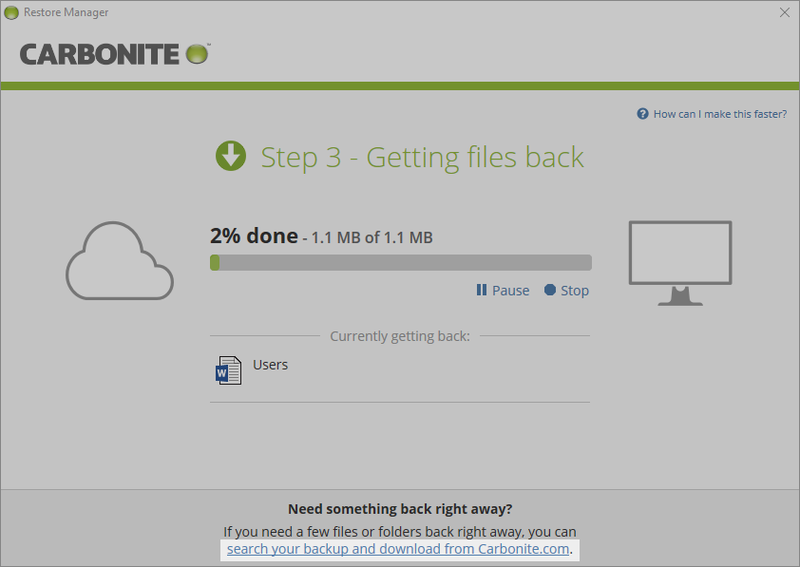 If you need a few files or folders back right away, click the search your backup and download from Carbonite.com link. You will be directed to log into your Carbonite account to access the Anytime Anywhere Access feature. To help your restore finish as quickly as possible, we recommend that you Configuring your power settings and Windows Automatic Updates so your computer doesn't sleep or restart. If your computer restarts for any reason, your restore will resume from where it left off when it reconnects to the Carbonite servers, but it will delay the process. Your restore will progress automatically as long as your computer is powered on and connected to the internet. You can continue to use your computer as needed, but please try not to move or delete any restored files while the restore is happening to avoid potential issues. After the restore is finished, please see our post-restore checklist article for instructions on what to do next. You can close the Restore Manager window during the restore process. Your restore will simply continue in the background. Note: The View Restore Status... option will only appear after the restore queue is created and file restores are under way. If you do not see this option shortly after beginning a restore, it should appear within a few minutes. After installation, you may see popups on your screen indicating that your backup is paused for safekeeping. This is perfectly normal and helps preserve your backup so you can safely restore your files. 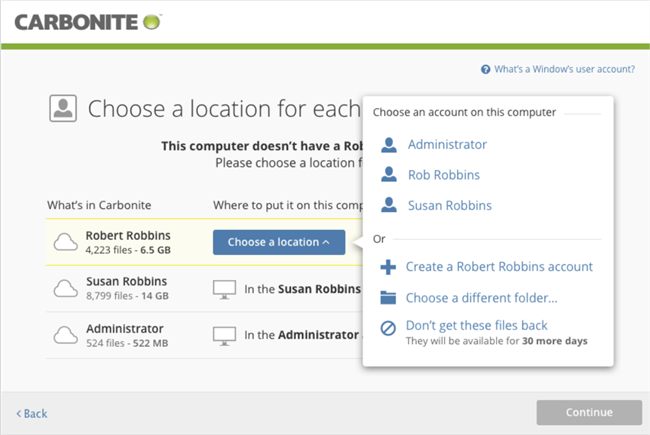 The Restore Manager wizard allows you to restoreTo download files from Carbonite's servers to your computer. your entire backup to your computer. If your restore is in progress but appears to be stuck, please visit our stuck restore guide for step-by-step help in diagnosing and resolving the issue. Do NOT exit Recover Mode at any time while you are restoring files. You should only exit Recover Mode when you have restored all of your files and are ready to start backing up again. The Restore Manager will prompt you to resume backup after everything is complete. Do NOT delete any restored files or move/edit/delete any restored folders until the full restore operation is complete. You can safely open, edit and save a restored file while other files are still restoring.